Stroke volume and heart rate combine to form cardiac output, which the National Strength and Conditioning Association (NSCA) reports is the total amount of blood ejected to working areas of the body. Stroke volume refers to the amount of blood that is ejected with each systolic beat, and heart rate is simply the rate at which the heart beats, usually calculated in beats per minute. Both stroke volume and heart rate are interrelated, and an increase in one often results in a decrease in the other. Stroke volume and heart rate are influenced by a variety of factors, most notably exercise, neural and hormonal factors, and diet and medication. The NSCA writes that acute exercise tends to result in an increase in cardiac output, resulting from an increased need for blood supply to working muscles. Over a period of time, chronic exercise results in a larger and stronger heart, known as "athlete's heart," which allows for greater supplies of blood to be ejected with each beat. If adequate oxygen and blood supply are provided with each ejection, only a small increase in heart rate is needed to deliver all the nourishment the muscles need. Therefore, aerobically trained exercisers experience greater stroke volumes and lower heart rates both during exercise and at rest. Heart rate and stroke volume are also influenced by the central nervous system and hormonal release. The book "Physiology of Sport and Exercise" reports that impulses from the brain travel through the nervous system and can increase cardiac output. For example, when psychologically stressed, the hormone cortisol is released into the bloodstream and heart rate is increased to prepare the body for action. Further, excitement can lead to the release of the hormone epinephrine, causing a constriction in the blood vessels, which in turn lowers stroke volume and increases heart rate. The consumption of substances involved in normal food intake and medication can influence heart rate and stroke volume as well. According to "Physiology of Sport and Exercise," food intake results in increased heart rate to help begin the digestive process. If dehydrated, water loss can lead to a rise in core temperature, which causes redistribution of blood flow to peripheral muscles. This leads to a drop in blood volume and thus a drop in stroke volume. In order to adequately supply blood from the heart to the rest of the body, heart rate increases. Many medications also affect heart rate and stroke volume. Stimulants, such as tobacco and nicotine, raise heart rate, while beta blockers and depressants lower heart rate. Many other factors influence heart rate and stroke volume. "Physiology of Sport and Exercise" reports that age, gender and the environment can either raise or lower cardiac output. 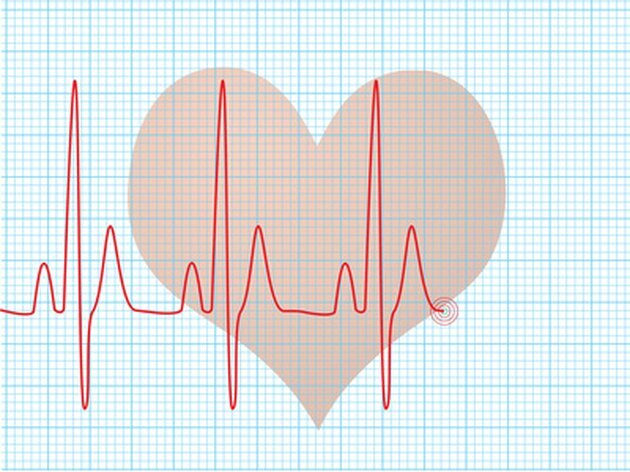 With increased age, people tend to experience lower maximum heart rates and stroke volumes. Females tend to have higher cardiac outputs because of the lower absolute heart volume in the female body. Finally, factors such as noise, temperature extremes, pollution and altitude can cause fluctuations in normal heart rate and stroke volumes.